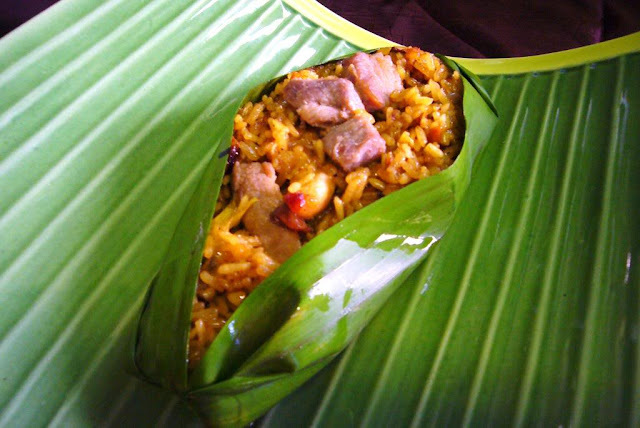 Fresh coconut milk and glutinous rice are the main ingredients of this “poor man’s” version of paella. 1 Heat the oil in a pot or large saucepan and stir-fry the garlic until golden brown, then stir-fry the onion until translucent. Add the chicken and pork and stir-fry until browned, about 5 minutes. 2 Add the rice, bay leaf, salt, coconut milk, peas and ground turmeric, and stir the mixture to prevent it from sticking to the bottom of the pot. 3 Reduce the heat, cover, and simmer over low heat for 20 minutes or until the meat and rice are almost cooked. 4 Add the shrimp and simmer for another 5 minutes until they turn pink. Remove from the heat and serve garnished with the hard-boiled eggs and bell pepper.